This week, I’ve got something really exciting to share with you all! You may have already seen a fair amount of noise on Instagram about Puffco’s latest innovation. If not, then let me be the first to introduce you to the Puffco Peak. Dabbing technology is something I’m genuinely excited about, so I pre-ordered the Peak at full retail price ($379.99) the second it became available to the public a few weeks ago. (I want to make it clear that I haven’t been paid by the manufacturer for my take on this product.) 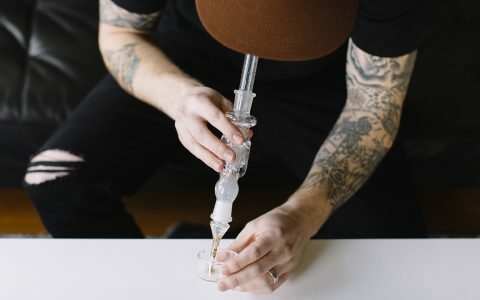 I’ve been waiting anxiously for someone to develop a portable e-rig that truly offers the control and practicality that electronic nails provide, while at the same time delivering an authentic dabbing experience. I had high hopes for the Peak, because Puffco has been a leader in portable concentrate consumption since they came onto the scene in 2013. So when the package finally arrived two weeks ago, I opened it up immediately to gave the rig a full test run. What I found was a novel and innovative piece of technology that disrupts the current market for portable concentrate vaporizers. 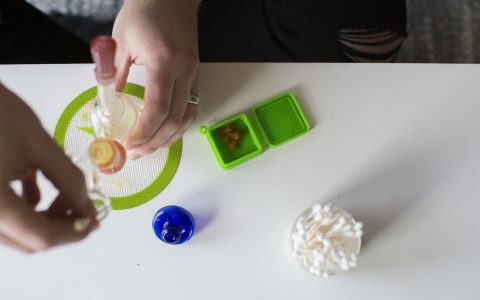 It offers a streamlined and approachable platform for seasoned dabbers and novices alike, and makes dabbing so simple that my glass rigs are quickly starting to collect dust. What Is the Puffco Peak? 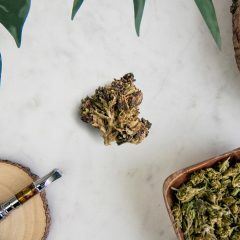 The Puffco Peak is an electronic smart rig that offers convenience and efficiency in a highly portable package. 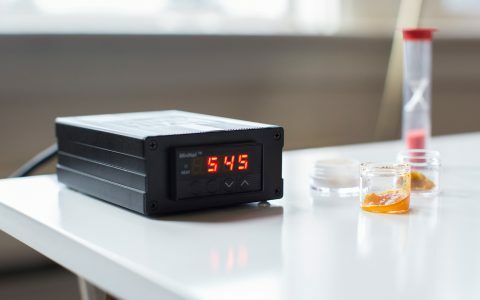 Its base is essentially a compact, rechargeable electronic nail with four heat settings, featuring a removable ceramic bowl for its dabbing surface. A single button on the front controls the device, and temperature feedback is delivered by a changing spectrum of light from the LED ring that wraps around the lower pedestal. 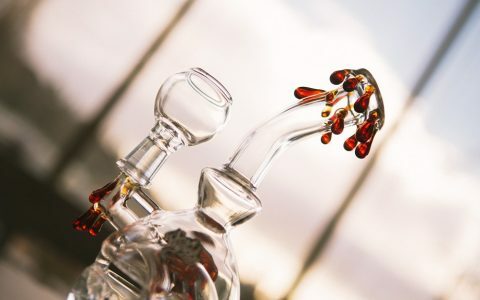 On top sits a hand-blown glass chamber that provides water filtration and vapor diffusion through a dome-style percolator. The Peak sits at just 7 inches tall and is reminiscent of a small, banger-hanger style rig that many dabbers are used to. How Does the Peak Compare to Other Dab Setups? This gives you lots of options for a quality low-temp dab every time. I’ve been enjoying mine at the 500°F setting, which is denoted by a green, blinking light when it’s heating up. The Peak gives off a subtle vibration when it’s hot and ready to dab, which I found to be a nice feature. It will vibrate again when the heat cycle is complete, letting me know that the bowl will slowly cool. When I’m sharing the Peak with others, I can tap the button twice to activate “Sesh Mode.” That way the nail stays hot when I pass it to a friend. With the Peak, I don’t have to wait for the nail to heat up before I serve my dab. Instead, there’s an option to load a dab and cap it before heating the nail. Within 20 seconds, the nail is hot and already producing vapor, making the process so simple. 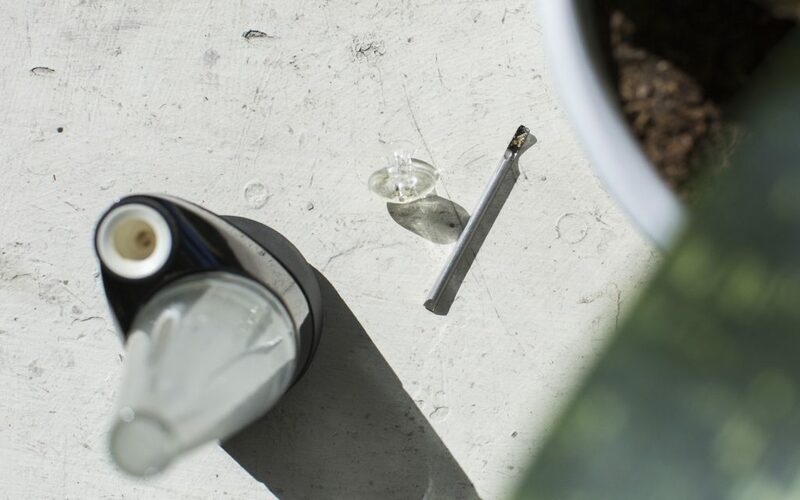 For traditionalists, the Peak also lets you serve a dab the more conventional way, by applying it once the nail is hot and ready. As with any quality product, the Peak isn’t perfect, and there are a few specific areas in which it left a little something to be desired. The bowl is only available in ceramic, and there’s only a single style of percolating attachment. Puffco extols the value of a ceramic dabbing surface, and while my bias remains with quartz, I’m starting to understand why they use ceramic. It consistently provides a quality of vapor and flavor that I can’t ignore. 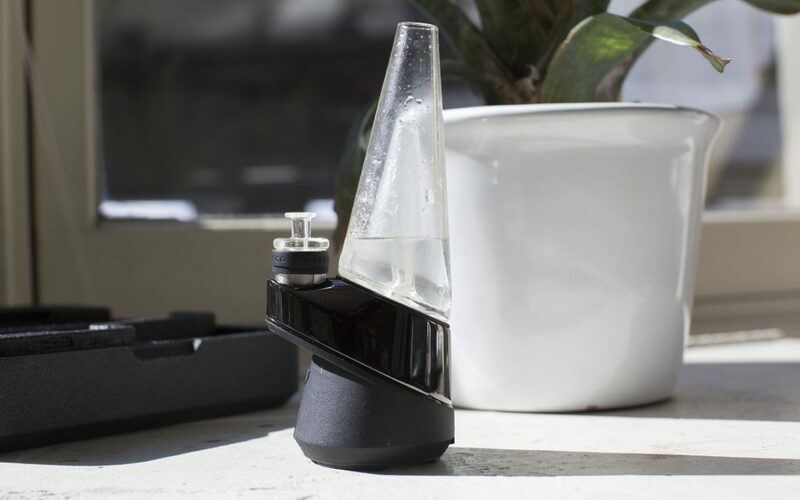 After some quick digging for Peak accessories, I learned that Puffco intends for the Peak to be a platform–meaning that other producers and glass artists can innovate their own attachments. 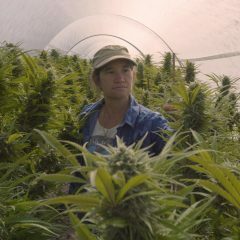 It seems to be working for them—I’ve already seen a few custom attachments and accessories trickling through my Instagram feed, including custom-made quartz bowls and recycler attachments. All in all, I was impressed. The Peak pushes the envelope of what a portable, electronic rig can be. It might not be for everyone, but it’s for me. In the two weeks I’ve had it, I’ve only hit my other glass rigs a couple of times. 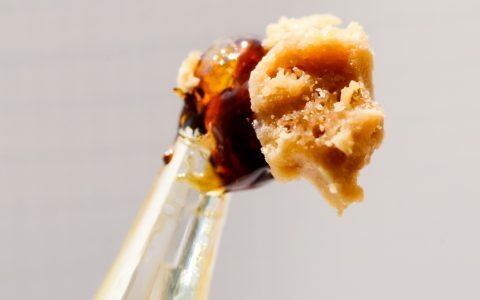 The convenience and ease make it so simple for me to drop in a dab, heat it up, enjoy some flavorful terps, and get right back to whatever was doing. It’s also fun in social settings because it makes dabbing accessible and approachable to anyone who might be concerned about using a butane torch. If you’re looking to streamline your dabbing experience with the latest technology I recommend you check out the Peak. It only makes sense that this week’s Avid Dab is taken from the Puffco Peak. So, I loaded it up with some Zeinberry Banana Live Resin from Critical Concentrates. Zeinberry Banana is a mix of Blueberry, Goldenberry, and Strawnana genetics. As the name suggests, it has a pungent fruity profile that fills a room instantly. The Peak gave a nice flavorful cloud of vapor as this little diamond vaporized with the saucy terpenes it sat in. Delicious! What’s your take on the Puffco Peak? Share your experiences in the comments section below, or post them to Instagram and tag me using #aviddabber. If you want to see more of the Peak in action, follow me on Instagram (@the.avid.dabber). I’ll be posting more photos and videos in the coming weeks. Check back next week for another installment of The Avid Dabber and in the meantime, ONLY DAB THE BEST! Ohhh Boy. Payday can’t come soon enough. 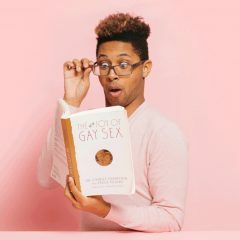 Good read, as usual, Will. Thanks! Glad you enjoyed it. Post a photo when you get your PEAK. You’re going to love it! I reserved a PEAK when it was first announced, and have had it for several weeks now. I also have a Volcano and a Plenty for herb, and a Vape-X-Hale, Dr Dabber Boost Black Edition, Puffco +, and now Puffco Peak, and while I used them all for variety, the Peak has become my ‘go-to’ choice for being SUPER-EASY to use, quick heat-up, easy to clean, and this sucker ‘delivers the mail’ just about as well as Dr Dabber Boost. Both have loads of flavor and clouds – Three Thumbs Up! I love the peak but you should really check out a huni badger electric nector collector they rock. I bought my wife one of these for her birthday in August. Its now December and we’ve gone through 4 atomizers. 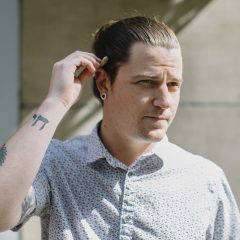 Each atomizer costs $40. I contacted Puffco to inquire about the issue. There response was that the atomizers have no warranty. They last 1-3 months. At the very best, with each atomizer lasting the full 3 months, that means you’re spending $160 a year on atomizers. I have already spent that in 4 months. We have this rig and the dabber switch and the Peak definitely hits the best but not by much. The switch doesn’t have replaceable atomizers. At this point I am going to have to list my Peak on eBay because I will not continue to pay $40 a month in atomizer fees. Puffco didn’t seem to mind the issue. At the end of the day, Puffco might just be banking on making all their money off atomizer margins. Great looking expensive piece of gear for the three months that it worked. is this company going out of business?? Does anyone know why they won’t honor their warranty?? There’s still someone in the office giving me the runaround, saying send them a video of me plugging it in, which I did. But ultimately I was ignored. Horrible product, warning: don’t buy! My peak was bad out the box bought direct from their webpage, contacted customer service, I sent part for inspection (after questionnaire and sending video), They deem the part defective, confirmed my mailing address (that they should have already had from my buying from them directly), they sent a refurbished replacement peak battery, worked for 2 uses, then completely pooped out, contacted customer service again, sent part in for inspection, battery deemed “fully operational,” same refurbshed part then shipped back to me, battery still did not operate at all after multiple hours of trying to make it work and buying several $45 atomizers to test to no avail, contacted customer service and they requested the part to be returned once again for inspection (after same process as above), concentrates going bad and all of this over a 4 month period of time during their 1 year warranty. Then I ask for a refund, told I asked too late and their policy only allows for unopened items for refunds anyway and the rest is back and forth with their same template messages. I asked for a manager that clearly wasn’t a manager – just some correspondent via e-mail making up policies as communications went along and finally retaliating by offering an out of policy deal that I was not interested in, then withdrew the “deal” solely because they received notice of a formal complaint I filed through the BBB. They have a zero tolerance policy for customers that choose to exercise their fair business consumer rights. Best to look for something better and more reliable. Don’t make the mistake I did and save your time, money and integrety.